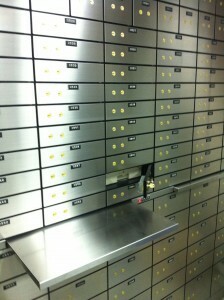 Guardall Safety Deposit Boxes are constructed of solid polished stainless steel. Inside each safety deposit box is a heat and impact resistant durable lightweight bond box made of heavy-duty poly-propylene. Every box has a numbering system which is determined by the customer. The numbering system is white intaglio characters on a durable black plastic. 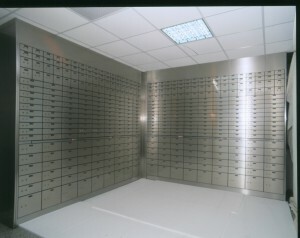 There is a choice of locking systems for the safety deposit boxes, either dual key where the customer holds one key and the institution holds the other, and they work simultaneously together to open the box. The other locking system offered is the Guardall Electronic Control Locking System; please contact us to discuss this diverse system. Pull out shelf, which can be mounted between the SDB configurations. This makes it easy to place your valuables on for inspection or rearranging. Bases, a heavy channel steel base with stainless steel trim and levelling legs. Ladder, a 2 or 3 step ladder to meet the height required to access the safety deposit box.